Boulder of the Month (now defunct, or perhaps taking a rest/opportunity to stock up on fresh finds) was often, quite unreasonably, treated with ridicule or open disdain. Truth is that in amongst the cosmic jokes and blatant blags Big G hid some gems. Remember, this is the man who tipped off yours truly about Porth Ysgo back in the late '90s! 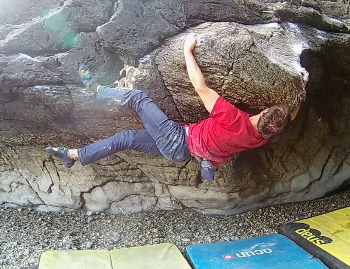 Anyway, it turns out that the Ghost Cave at Trearddur Bay has a classic 7A test piece, plus a supporting cast of quality lines. Initial serious exploration came from Lee Williams and Dan 'Bruce' Roberts, who picked off many of the more obvious grade 6 lines. Matt Powell then came very close to getting the first ascent of the left wall traverse, dropping the final groove several times. Matt introduced Phil Targett to the cave, and it was Phil who bagged this superb line. Screwball Scramble rates 7A, with a few options for the finish: up the shallow groove, around the arete into the cave or a wild span and drop into the right wall traverse. The cave is tidal and does suffer from seepage and dampness - try and visit on a colder, windy day. A towel will be useful for drying holds. Approach: from Trearddur Bay on the B5445, drive up Lon Isallt road with the football pitch on your right. Park considerately on the layby at the first large cove before the 'ghost house'. Walk around the rocky headland from the beach. This is very easy and takes about 10 minutes. Do not walk along the grassy headland as this is understood to be private property.